It's been a whirlwind few months for Packetized Energy, the energy sector start-up spun off from a large Department of Energy project in 2016 by three University of Vermont electrical engineering faculty, Paul Hines, Jeff Frolik and Mads Almassalkhi. Since late last year, the firm completed a pilot with the Burlington Electric Department, launched ambitious demonstration projects with Green Mountain Power and the Vermont Electric Cooperative; welcomed Scott Johnstone, former head of the much admired Vermont Energy Investment Corporation, as CEO; hired three full time staff; completed a month-long stint at the energy accelerator, Accel-VT, earning acclaim as one of the top firms among the national companies in its cohort; licensed the founders' technology back from UVM; and left the co-working Inspire space at Green Mountain Power's headquarters it has occupied for the past year-and-a-half to move into its very own offices in Burlington's Chace Mill. What's behind the impressive series of breakout moves? Packetized Energy, it turns out, is the hottest of hot commodities in electric utility circles, the creator of a set of clever algorithms with products to match that could go a long way toward addressing the great challenge facing the energy sector and the planet: how to harness the increasingly abundant, but fickle, power of renewables like wind and solar when the sun doesn't shine and the wind doesn't blow. If the company delivers on its promise, it could be a very big deal indeed, says private equity guru and serial entrepreneur Bob Zulkoski, chairman of the Vermont-focused investment firm Vermont Works, an early investor in Packetized Energy. As the founder of a successful company "also in the energy resource field, I'm very familiar with this space," he says. "Packetized is one of the few companies I've seen in Vermont that could become what's called a unicorn," a company whose assets are valued at $1 billion or more. "They are in the right place at the right time with a very innovative approach." In describing how Packetized Energy's products manage energy supply and demand compared with the current system, Almassalkhi sounds like a Vermont progressive. "We're bottom up; the traditional system is top down," he says. The change is indeed radical. Currently utilities are "sucking data from devices, creating models of how everyone uses energy, and then basically pushing out schedules to the devices," Frolik says. "It's very data intensive both in terms of communications and computations." And it doesn't work very well. Consumer demand for energy often exceeds supply, forcing energy companies to buy expensive, dirty power from thermal energy plants to close the gap, and renewables often aren't available when the utilities need them. Packetized's bottom up approach couldn't be more different. The company produces smart controllers for the big energy hogs in the home: hot water heaters, batteries (both for charging electric vehicles and for power back-ups like the Tesla Powerwall) and HVAC systems. The controllers sidestep the complexity of trying to predict consumer behavior by asking a simple question: How much energy does my device need right now? If the water in the water heater is too cool, for instance, it asks Packetized's cloud-based server if it can have a small "packet" of energy from the grid to warm the water. The cloud, equipped with software that allows it to speak "packetized" and a demand model from the utility that provides data on when it would like to supply power—including when renewable energy supplies are likely to be available—gives a variable answer. "Instead of the water heater turning on right away," says Almassalkhi, "it basically says, 'Can I turn on'? And our cloud service says, 'Okay, yeah, it looks like all is good, go ahead and turn on.' And another device may come up and say, 'Okay, I want to turn on, and they say, well, not right now. Come back later.'" If the hot water heater really needs energy, it will nag the server more frequently. If it's still turned down, it will take matters in its own hands and start warming the water, so consumers aren't left in the lurch. By heating the water in short bursts spread throughout the day and by staggering consumers' mini-power requests so they don't happen all at once—a similar process applies to energy request from HVAC, batteries, and electric vehicle chargers—Packetized Energy helps power consumers and power producers achieve a Zen-like state of balance. "It's like having a pile of sand shaped into a peak," says Almassalkhi, who has won two awards from the Department of Energy totalling nearly $4 million to support the research underlying the company's products. Hines also has an National Science Foundation grant that has supported basic research the company's products tap into. "What we do is shake the pile so it flattens out." Packetized's pilot with BED showed that the company's controllers, installed on eight hot water heaters in Chittenden County, could successfully exchange packetized information with the cloud service and heat water in small, distributed increments. The new demonstration projects with GMP and VEC are both larger, with smart controllers in the process of being installed on 450 hot water heaters around Vermont between the two, and ripe with market significance. "It's setting things up to show that this technology is for real," Frolik says. Academic articles and industry consultants have guessed at how much money utilities would save if they used renewable energy more consistently and avoided paying top dollar for supplementary power when demand exceeds supply. But the Packetized trial will be the first to get a real-world data on cost-savings. "We'll be seeing what the real financial benefit is to the utility of installing our devices in the field and interacting with the grid in this new way," Frolik says. If the project is successful, and utilities save up to what the company projects, about $150 per water heater, it's easy to imagine all heck breaking loose. "I would say about half the utilities in the country know who we are," says Almassalkhi. There would be keen interest, to say the least, he says, if the demonstration project pays off. 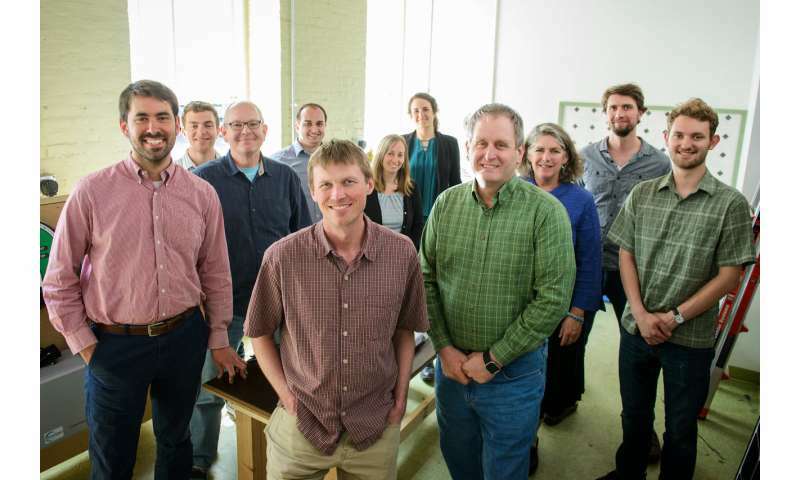 "They're hitting the market at the right time with an innovative product," says Corine Farewell, director of UVM's Office of Technology Commercialization, which has worked closely with Packetized's faculty founders as the company got off the ground. "They have a strong team, including a very strong CEO in Scott Johnstone. They have great partners in GMP and VEC. And they have customers. They're hitting all the right notes." Johnstone couldn't be happier about his new digs. "If we're going to have clean, affordable and easy-to-use energy, the real focus of the next wave is dealing with demand-side management and optimizing the grid," he says. "That's what Packetized Energy is here to do and create, and that's what is so exciting about the work we're doing. When you consider all the grid-edge devices that will be interacting with the grid as the Internet of Things comes online, the potential of this company is really limitless."